If the Nevada rancher is forced to pay taxes or grazing fees, he should pay them to the Shoshone. Editor’s Note: This article is adapted from a post that originally appeared at Indian Country Today Media Network. In the wake of his comments wondering if “Negroes” were “better off as slaves,” Nevada rancher Cliven Bundy has gone from a right-wing folk hero to a right-wing embarrassment. The Fox News commentators and Republican senators who championed his cause just a few days ago are in full retreat, denouncing Bundy’s remarks as “beyond repugnant” and “beyond despicable,” as Sean Hannity recently put it. That they certainly are. But even before Bundy made his outrageous slurs against African-Americans, his insurrectionary claims were already racially loaded. Bundy has repeatedly trumpeted his “ancestral rights” to have his cattle graze on land administered by the federal Bureau of Land Management without paying taxes for the past twenty years. “My forefathers,” he has said, “have been up and down the Virgin Valley here ever since 1877. All these rights that I claim have been created through pre-emptive rights and beneficial use of the forage and the water and the access and range improvements.” A simple search of Clark county property records by KLAS-TV, a Las Vegas television station, however, revealed that his family had purchased the ranch in 1948 and had only begun grazing cattle on it in 1954—eight years after the founding of the BLM. KLAS reporters also received a map from the Moapa band of Paiute Indians showing how the land the Bundy ranch is on was promised to them by federal treaty. 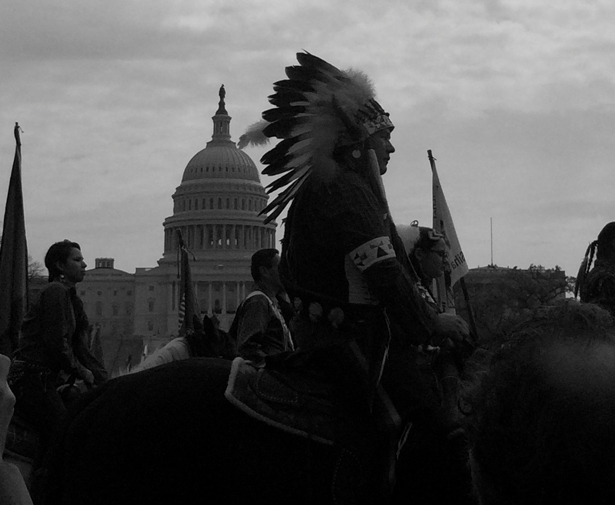 Even as many Americans continue to deny the existence of Native nations’ “ancestral rights” to land and resources, the libertarian right is eager to co-opt our history to promote their own battles against the federal government. Last year, gun control opponents circulated on Facebook and Twitter the graphic photo of frozen Lakota victims being buried in a mass grave at Wounded Knee with taglines saying “Wounded Knee was among the first federally backed gun confiscation attempts in United States history. It ended in the senseless murder of 297 people.” A meme also made the rounds then featuring a vintage portrait of a Native leader emblazoned with the words, “I’m all for total gun control and trusting the government to protect you. After all, it worked great for us” around his face. Disregard, if you can, the incredible callousness of using such tragedies (my great-great uncle was a survivor of Wounded Knee) to limit restrictions on sales of automatic weapons and to prevent waiting periods for gun purchase—all of which have been shown to save lives. Instead, I would like to explain the very real difference between these two fights: one for the sovereignty of pre-existing nation states on this continent and one for what Bundy and his supporters call the “Sovereign Citizen” movement, which basically translates to: they make up the rules. Native Americans, for one, are more than just an ethnic group or simply just American citizens. Until the 1924 Indian Citizenship Act, most were not citizens of the United States and were still just citizens of our own nations within the borders of the United States. But for many full citizenship with voting rights did not come about until the Voting Rights Act of 1965. So for most of US history, the only real citizenship Native Americans could claim was to their respective Native nations. When tribes speak of “being nations,” they are not being poetic or nostalgic, they are speaking of the real political status our nations hold internationally. There are tribes that issue passports. States have no jurisdiction over our lands (something they dislike greatly). And the constant discussion of honoring treaties is not something to be taken lightly, either. The US government signs treaties only with other nations, not with ethnic groups. These treaties are ratified by Congress, and under international law, a nation-state cannot treaty away its sovereignty. Hence, Native Nations still exist. Under US Indian Federal Law, we are called “Domestic Dependent Nations,” a term I dislike because the designation relies on a concept of public international law known as the Discovery Doctrine. This idea comes out of a fifteenth-century Papal Bull that awarded the land titles of “discovered lands” only to Christian “discovering nations.” Non-Christian “discovered peoples” possess only the right to exist on the land, similar to the rights of animals. To this day, this doctrine underlies much of US legal claims to the land within the United States. The doctrine is itself a denial of the basic right of Indigenous peoples to title to their land. Bundy’s hullabaloo is particularly ironic considering that the Western Shoshone Nation’s claim to the land predates his own. He has declared he will only recognize the original sovereignty of the state of Nevada, despite the fact that Nevada did not achieve statehood until 1864 and as such has no pre-existing claims to sovereign status. Only the thirteen original colonies possessed sovereignty prior to the creation of the United States. The 1848 Treaty of Guadalupe Hidalgo with Mexico gave up Mexican claims but did not guarantee Indigenous land rights. Shoshone sovereignty over the area in which the Bundys graze their cattle was recognized by the US via the Treaty of Ruby Valley (1863)—a treaty that did not include any land concessions. In 1979, the US government attempted to legitimize claims to Shoshone land (which encompasses nearly all of Nevada) by paying $26 million to the Department of the Interior for 24 million acres. It should be noted that the Department of the Interior is a branch of the federal government—hence the government paid itself for Shoshone land. In 1985, the Supreme Court ruled that this payment to the Department of the Interior constituted Shoshone acceptance of payment for their land. In 2004, the US attempted to distribute $145 million as payment for Shoshone land in Nevada. Seven of the nine Western Shoshone tribal councils have refused to accept this payment and are holding fast to their demand that the original treaty be honored. In 2006, the same year the US District Court for Nevada dismissed Shoshone claims, the United Nations Committee for the Elimination of Racial Discrimination found “credible information alleging that the Western Shoshone indigenous people are being denied their traditional rights to land.” So if Cliven Bundy wishes to pay taxes or grazing fees—he should pay it to the Shoshone. I find the unity being forged in the Cowboy Indian Alliance far more interesting and representative of the true ideas of our collective nationhood. The very origins of the United States can be traced to speeches the leader of the Iroquois Confederacy gave to the colonists the generation before the Revolution—speeches that were published by Benjamin Franklin’s printing press. It is indigenous ideas of what it means to be a people and of democratic rule that are the inspiration for America itself. It make sense then that it would be my Yankton Dakota Sioux relatives and farmers and ranchers from South Dakota and Nebraska who are leading the fight for a new idea of what American will be in the twenty-first century. My dad’s cousin Faith Spotted Eagle has been active in the fight. When I was home in South Dakota at the Yankton Sioux’s Fort Randall tribal casino last August, I found Faith busy holding a conference with white ranchers and farmers from Bold Nebraska. There, they formed the Cowboy Indian Alliance and united their efforts to protect their water and their way of life on the land against the pipeline. Last week on Earth Day, they took their message to Washington, DC and held a tipi encampment on the Washington Mall all week. All of those beautiful tipis facing the Washington monument were a sight to see. On Saturday, they presented a specially painted tipi to the National Museum of the American Indian as a gift to President Obama, reminding him of his obligations to protect the water and the land. In Dakota, we call such encampments tiyospaye, a word that means more than just a circle of tipis. As my great-great aunt Ella Deloria wrote, tiyospaye represent how “all Dakota people were held together in a great relationship that was theoretically all-inclusive and coextensive within the Dakota domain.” The bounds that tie us together as a people through kinship are what makes us Dakota (“allies”) and without it we cease to exist as a nation or as they say in Dakota, Oyate. It is this lesson that will carry the day, not the tired and divisive ideas of Bundy and his militia.